Augochlora sp. (pura?) (Sweat Bee). Size: approx. 5 mm. Photo: 06/16/11, noon. 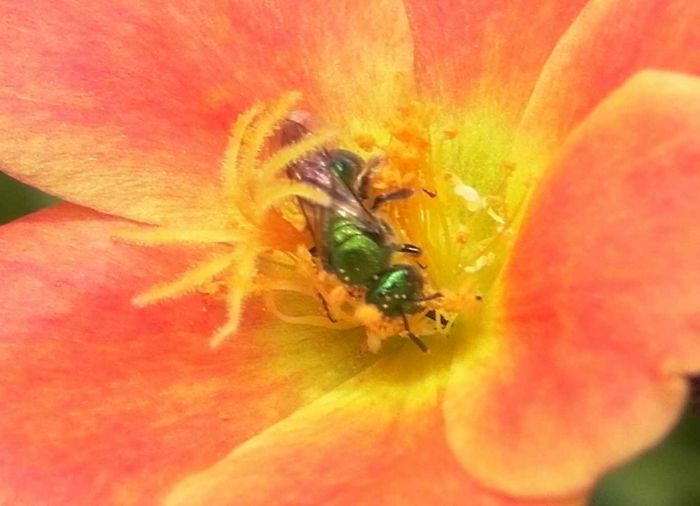 One busy "sweat bee" ... The 'green metallic bee' belongs to the very large family Halictidae. Perhaps it is Augochlora pura but I'm not sure. All sweat bees are attracted by sweat (to lick off salt) and can sting. I love the Wikipedia statement that their "sting is only rated a 1.0 on the Schmidt Sting Pain Index, making it almost painless."